‘Captain Scarlet: The Vault’ is the official hardback guide to the making of Gerry and Sylvia Anderson’s classic Supermarionation series. The book will be launched at Fanderson’s Special Assignment convention at the end of September – where fans can get their hands on copies for the very first time! In addition to the standard edition, a strictly limited edition will also be available at the convention. This version features a different dustjacket, with Captain Black on the front cover. Each of the Captain Black editions is numbered, and will be signed by author Chris Bentley. The Captain Black edition will not be available in any shops and is limited to just 100 numbered copies! Back in May we revealed the book’s beautiful original scarlet cover, but we think the black limited edition is rather fetching! 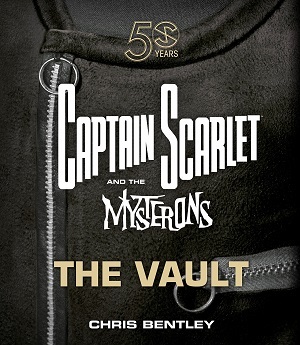 Captain Scarlet and the Mysterons: The Vault is published by Signum Books on 6 October, but Chris will be signing advance copies at Special Assignment on 30 September and 1 October. SIGN UP TODAY – TICKETS STILL AVAILABLE! Tickets to Special Assignment start at just £65 per person for one day, or £110 for the whole weekend. We’ve managed to keep the ticket price the same as The Future Is Fantastic! convention in 2015 because we’re a fan club and no one is taking a salary. Saturday-only or Sunday-only tickets do not include the Saturday evening meal or any other refreshments that are included in the weekend ticket. This entry was posted in Events, Merchandise and tagged Captaon Scarlet, Special Assignment by admin. Bookmark the permalink.